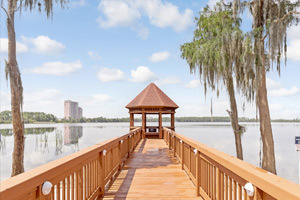 Located in Orlando, Sheraton Orlando Lake Buena Vista Resort is within a 10-minute drive of Orlando Vineland Premium Outlets and Disney Springs®. This 4-star resort is 3.9 mi (6.2 km) from Disney's Lake Buena Vista Golf Course and 4.4 mi (7 km) from SeaWorld® Orlando. Make yourself at home in one of the 486 air-conditioned rooms featuring refrigerators and flat-screen televisions. Your pillowtop bed comes with premium bedding. Rooms have private balconies or patios. Complimentary wired and wireless Internet access keeps you connected, and cable programming provides entertainment. Private bathrooms with shower/tub combinations feature complimentary toiletries and hair dryers. Pamper yourself with a visit to the spa, which offers massages, body treatments, and facials. You're sure to appreciate the recreational amenities, which include 2 outdoor swimming pools, 2 spa tubs, and a health club. Additional features at this resort include complimentary wireless Internet access, an arcade/game room, and gift shops/newsstands. If you're planning a day at a nearby theme park, you can hop on the complimentary shuttle. Enjoy a meal at the restaurant or snacks in the coffee shop/café. The resort also offers room service (during limited hours). Unwind at the end of the day with a drink at the bar/lounge or the poolside bar. Full breakfasts are available daily from 6:30 AM to 11 AM for a fee. The preferred airport for Sheraton Orlando Lake Buena Vista Resort is Orlando, FL (MCO-Orlando Intl. ).